The two Sales/Food Drives combined yielded $700 in monetary donations and more than 600 lbs. of food donations for the L.A. Regional Food Bank! They sent very nice "Thank You" letters after each event. We plan to continue with 2 of these efforts each year, and I'm certain we'll only increase our collections! The Sale/Fund Raiser to assist the Red Cross Disaster Relief efforts in Japan collected a total of $1,025 in monetary donations! We're proud of the results, and the format seems to work: we offer nursery-wide discounts to get folks here, customers make a donation to participate, and then we donate a percentage of the total day's sales. Everyone seemed to have a great time, and we'll definitely do it again! We were also happy to participate in the Annual Windsor Square-Hancock Park Garden Tour, this year benefiting the "greening" of John Burroughs Middle School. We had a whole Market-like set up and sales were amazing! The Getty House (official residence of Mayor Villaraigosa) was the start- and end-stop of the Tour, and late in the afternoon I gave a talk on Organic Container Gardening. It was a great day and we donated 10% of our total Sales to the great work of the Windsor Square Hancock Park Historical Society. Click here to see the Garden Tour pictures! 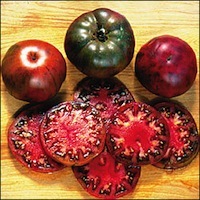 Tomatoes still rule the Farmers Market sales, and we're sowing new rounds regularly. Our Heirloom Season Kick-Off Sale (also a Food Drive) was mobbed the entire day with happy gardeners anxious to get their tomatoes going. We waited 3 weeks, and planted the 2011 Tomato Trial varieties (all the 17 new ones and 3 old faves). To See Rooftop Tomato Pictures Click Here! The soil looked beautiful, and everything was totally broken down. We added worm castings and a little more compost to make up for the settling, and they're on their way! Looking forward to lots of Alex's amazing Caprese! Corn, Melons, Spaghetti Squash & Scarlet Runners! Newest varieties coming to the markets are 2 types of sweet Corn, 5 varieties of Melon including the highly regarded Charantais, 3 more varieties of Green Beans including the amazing Scarlet Runners, and Spaghetti Squash (for a total of 5 varieties of Winter Squash.) We still have Organic Seed Potatoes and Leek Seedlings, too! This year we're growing Lettuces a little longer than usual; we're growing Summer Bibb, Jericho Romaine and other varieties that are reputed to resist bolting and hold longer in the warmer months. EarthBox Planting Classes are in full swing! Join us Monday, May 2nd or May 16th at noon to get your container garden going! That's it for now. We'll see you at the Markets and thanks, as always!! Help us raise desperately need funds for Japan! 10% Off All Certified Organic Nursery Plants, Blueberries, Fruit Trees and Gardening Products! ADMISSION is a mandatory monetary donation payable to The Red Cross. Please dig deep and give generously! Please Note: Discounts given only this day, this location!